There are a lot of cool effects that we can do in Android to static images, and I cover some of these in my conference presentation for 2014 entitled Graphical Magic. One technique that I cover in the presentation is how to blur images and the example code uses RenderScript to perform the blur because there is no simple API built into Android that we can use. Note: The following example code is developed for API17 and higher. I have decided against using the v8 support library for RenderScript. 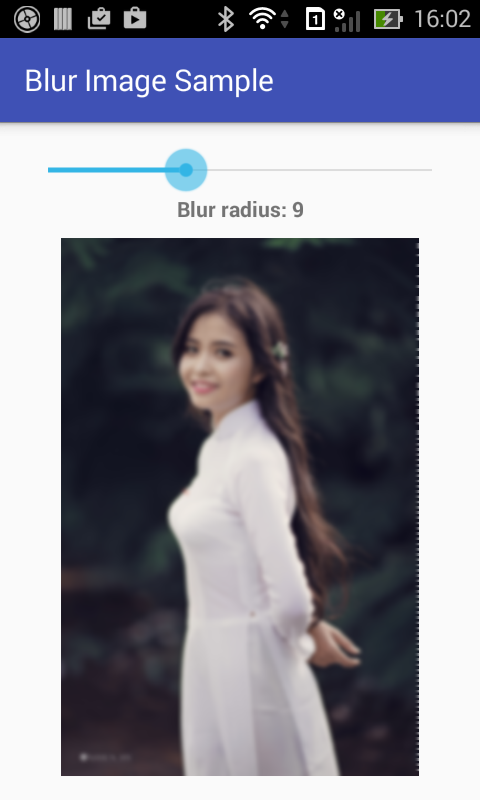 Note: like develope doc say, radius of Blur (a float value) supported from 0 to 25.0. So, please set max value is 25 for SeekBar. Recommended set Blur Bitmap for ImageView in onStopTrackingTouch() to avoid lagging in weak memory/chip devices. You may also use support v8 library to use this method, more details, see this post in Android Developers blog, I haven't mentioned here. Full code of this project now available on Github, you can clicked below button to view. Thank for reading, subcribe my blog to see newest tutorials!